Painters pants are easy to recognize and one of the original posts here was about why painters wear white pants. I recently got a pair made by Blaklader. I’ve had my eye on these for a while. The price is a little crazy and that’s why I’ve never purchased a pair but decided to take the plunge. A nice feature about these pants is that there are built in pockets on the knees for knee pads. This feature gets rid of one of the biggest headaches about knee pads, the straps. If you have ever worn knee pads you know that the straps rub the back of your legs and quickly become uncomfortable and since my knees have too many miles on them I like this feature. The pants have many pockets on them. Much more then any other pair I have owned. They even have bellowed front pockets that you can tuck inside your front pockets or pull them out to be filled with tools, nails, etc. No shortage of pockets on these pants. They are very well made and comfortable to wear. They are made in Sweden so perhaps that is why the sizing is a bit off. You will want to go up one size in the waist and down one size in the leg length. I ordered a pair according to my usual size and it was a no go. If I could change a feature on them it would be the grey knee pad pockets. I would prefer white. The grey definitely draws attention and perhaps that is what the manufacturer was looking for. 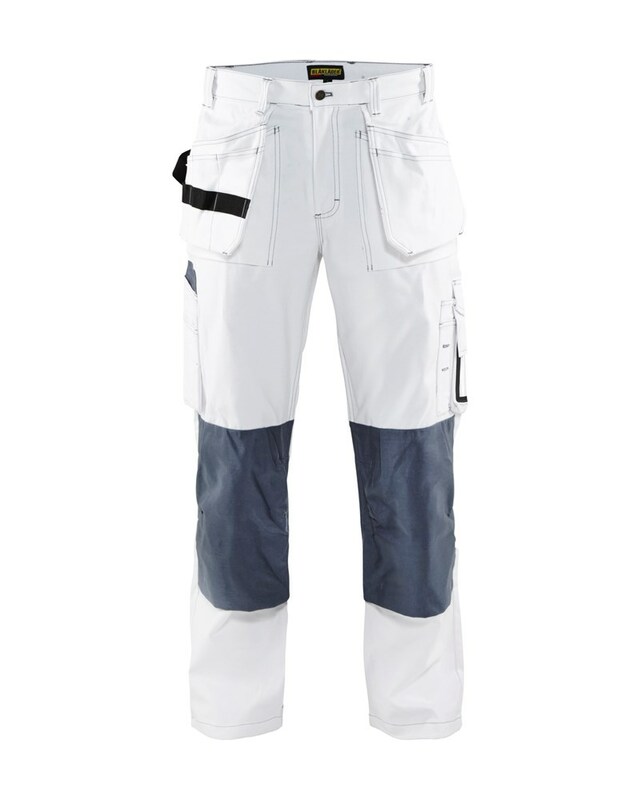 Blaklader makes all types of workwear and many of the pants incorporate the knee pocket feature so even if you aren’t looking for Painters pants, they might have a pair that will interest you. Especially if you have old knees, like me.